I haven't tried them but have seen them at Planet Organic in Edmonton. Thanks for all the great info. Sunterra's at Lendrum has them. Does sobeys have these yet? There are Sobey's locations that do carry CheeCha Puffs. We have seen them at the Lessard Location. 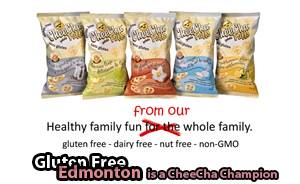 Ed's Gluten Free Store, Safeway and Shoppers Drug Mart also carries them.